My original excitement over the M4E1 was clear in my first review. I had obtained my first non-standard upper receiver and rail system and I had high expectations for the product. So how has it held up? Exceedingly well. This rifle accompanies me withe every range trip and has been a flawlessly operating machine. The interior of the upper receiver remains smoother than any other rifle I have handled and it just got smoother with use. When I say smooth, I mean to say with a standard bolt group and a A5 receiver extension kit, pulling the charging handle feels slick with the spring, buffer, and bolt unlocking consisting of most of the felt resistance. The torx screws have remained firmly in place with ceramic Rock Set and the hardware has not rotated out-of-place since first install. No hardware has loosened or fallen out. Teludyne Tech uses the M4E1 as the upper of choice for their Straight Jacket barrel system… which we will test in the coming months. Excited? Yes. Furthermore after discussing the system with Teludyne Tech, they noted they appreciate the product as it is a forging with excellent engineering characteristics. I had *no idea* the receiver was forged and going back to Aero’s webpage, sure enough, it reads as such in the description. Where have my reading skills gone? The M4E1 is also a good value from a cost perspective. The M4 upper comes in at about $150 with the free float rail selling separately for $140 for a 20 inch version in M-Lok or KeyMod. Comparing to high-end rail systems, it’s far cheaper than many of Daniel Defense’s products, cheaper than Larue, and far cheaper than the awful cost of some of the popular Geiselle products as well. I own a G Mk4 and its a nice setup, but it’s performance has not impressed me more than the M4E1 system from a cost to performance ratio. The 12 inch rail and upper weigh a joint weight of 19.8 ounces which is directly competitive with the weight of any modern aluminum competitor. I stay impressed enough to float the idea of obtaining another M4E1 set for a full length M16A4 improved build I want to do in the future. Why? Because its clean, well-balanced, and it is a great free float platform. 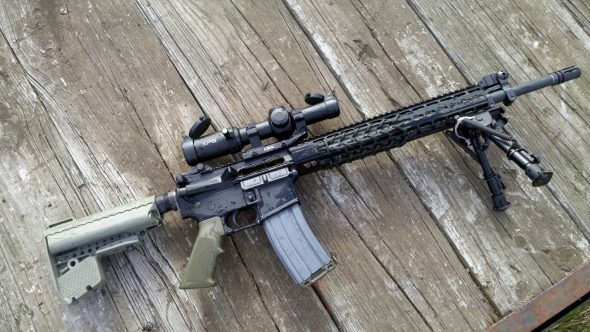 I still recommend the m4E1 and believe it has a part to play in a modern AR15 build which follows evolutionary manufacturing principles that reduce overall part count, simplify the assembly process, reduces system cost, and possibly increase system strength. In short, it still rocks. Get the upper for $111 for a blem over at Aero Precision. Note: I don’t make commission off any sales from Aero’s site, but that’s a good deal to try out this equipment. How many rounds do you have through it, if I may ask? The rifle shoots XM193ish loads and then it was 60 gr sierra varminters, followed by 69 grain SMKings, and then I settled on 75gr Hornady hand loads almost exclusively. I have gone through at least 1000 rounds of federal M193 based on my empty cans. 100 rounds of PMC xtac. 300-400 rounds of federal AE223J, 80 additional of winchester 5.56 nato, and then the rest of the loadings have been hand loads. I estimate somewhere around 3000-4000 rounds. I haven’t been keeping track of the hand loads as well as I should have been. Mine (AR10 & AR15-6.8 pistol) builds have been great. My experience’s have been equally pleasing .. though .. too expensive compared to a BCM slim rail option .. which I own many. How does she group with some of the rounds you have listed ? I got my forged M4E1 upper for $85 from Schuyler Arms online…you seriously CANNOT beat that…one day these parts and guns are going to be worth SO much more than we have in them. I know this article is a few months old, but wanted to chime in on the M4E1. I started a ‘new’ build using an M4E1 a handful years back. Based on how well that went together, and how solid it performed, I started migrating all of my new builds over to the M4E1/Enhanced Rail combo. Now I’ve a double handful of builds in 5.56 / 6.5Grendel / 300BLK, full-size and SBR, and under-rail suppressor setups. Unless I really want a ‘skinny’ rail for a build, I go to my stock of M4E1 parts when I start a build. Combined with Ballistic Advantage Hanson and Premium barrels all builds thus far have exceeded my expectations for performance, reliability, and accuracy.